Kellogg’s Australia has worked with Melbourne-based independent agency Akkomplice to create a striking outdoor campaign for Pringles. 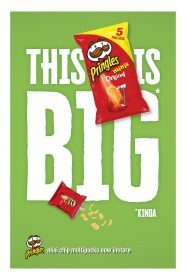 The work supports the Australian launch of a new mini version of Pringles, sold in multi-pack bags and sees the agency given responsibility for the brand’s first locally created campaign from owners Kellogg’s. Kellogg Australia & New Zealand marketing director, Tamara Howe said: “The campaign from Akkomplice and MindShare is fresh, bold, fun and engaging. “That’s exactly what we are looking for when it comes to the iconic Pringles brand. Akkomplice founder Kenny Hill said: “With so much uncertainty in the economy and our industry right now, it’s great to be firing on all cylinders and being asked by such high-profile and established brands and businesses to work with them on new projects. Aside from in-store and social media, the launch is being promoted to consumers throughout of home channels, via Kellogg’s media partner MindShare, with a comprehensive mix of APN Showcase, Adshel Street Furniture and Rail Panels and Moove Media Supersides.